Please note that our hotel is now 100PCT smoke free. 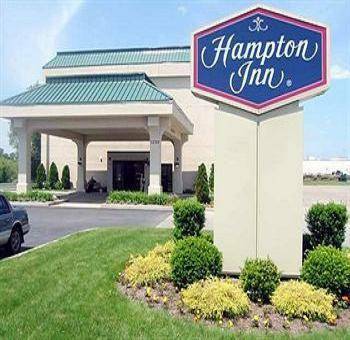 The hotel is 100pct non-smoking The Hampton Inn - New Philadelphia hotel in Ohio is located east of Interstate 77 off exit 81 in the heart of Ohio*s Amish Country. Within five minutes of this New Philadelphia Hampton Inn are local malls fine restaurants and businesses. Local attractions near this Ohio Hampton Inn New Philadelphia are the historical Schoenbrunn Village Trumpet in the Land an outdoor theatrical production Warther Carvings and tours of Sugarcreek an Amish country village. The New Philadelphia Hampton Inn in Ohio features 60 executive hotel rooms filled with amenities including a coffeemaker iron ironing board and hair dryer as well as complimentary high-speed internet and cable TV with movie channel. Sure to please the busy executive or leisure traveler New Philadelphia Ohio Hampton Inn hotel guests will enjoy complimentary On the House hot breakfast buffet served daily and Monday through Friday complimentary On the Run breakfast bags and USA Today newspaper. Guests staying at the New Philadelphia Ohio Hampton Inn can enjoy the convenience of complimentary wireless high-speed internet in the hotel lobby meeting rooms and all public areas as well as coffee and tea 24 hours a day in the hotel lobby. Hampton Inn New Philadelphia Ohio hotel guests can relax in the hotel indoor swimming pool or hot tub work out in our fitness center or utilize the 1400 square feet of meeting and banquet space with an amazing view overlooking the Tuscarawas River. All stays at the Hampton Inn New Philadelphia hotel in Ohio are backed by our 100 satisfaction guarantee. If you*re not satisfied we don*t expect you to pay. That*s 100 Hampton. We love having you here at the Hampton Inn New Philadelphia Ohio. all reservations must be guaranteed with a major credit card or advance cash deposit to hotel regardless of time of arrival. all reservations must be cancelled by 11:59pm the night prior to arrival unless deposit required. Ribs Steaks and much more. One man's collection of every model of television, from its birth through the 1950s. ~2 miles from New Philadelphia. He was once Public Enemy #1. Now his face hangs on a basement wall, over a washing machine. ~48 miles from New Philadelphia. ~49 miles from New Philadelphia.